Like most mornings, today I got up and started my day with my daily dose of internet. After catching up on Facebook, Twitter, and all of the blogs I follow, I ended up on moderncat.net, looking at green cat toys, even though I know that Jack is happiest with a well loved catnip mouse, some crumpled up paper, or a practice golf ball (stolen from my husband’s collection of balls used in science experiments with elementary students). Nobody golfs in our house. The toys featured on Modern Cat were all very beautiful, but Jack plays nicely by grabbing the toy in his front paws and licking it aggressively while shredding it with his hind paws. I’m looking for toys that will stand up to a beating. As in, I’m looking for plain toys, so that I won’t be sad when he licks the colour out of them and tears them up. I’m sure the toys blogged about at Modern Cat are plenty durable. A quick Google search brought up this post, and left me actively considering spending money on cat toys again – specifically “Billy Bob the Cork Ball” and a CatTamboo. I’ve been looking for a toy on a string for quite a while so that we could actively play with Jack, but the cheap, brightly coloured plastic toys I’ve seen are a little too, well, plastic for my taste, considering they’ll just end up in the landfill eventually. The CatTamboo seems to be a great sustainable, natural, possibly-compostable alternative. But I’m hesitant to pay to have cat toys shipped across the continent without seeing them in person first. Usually a new cat toy lasts a couple days, and then Jack discards it and never wants to play with it again. 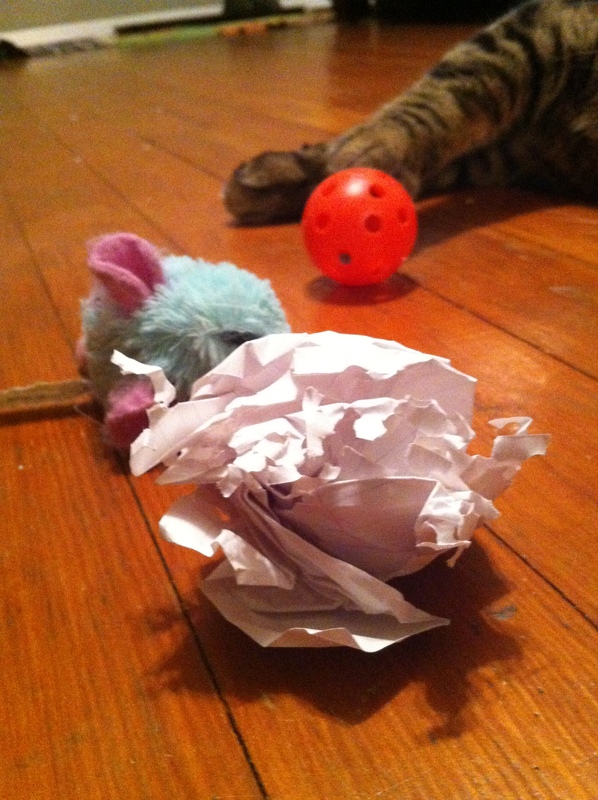 Perhaps my local pet store could be convinced to start stocking them… For now, crumpled paper balls will have to do. Do any readers have experience with these toys? Categories: Play | Tags: cat toys, Jack, re-use, sustainable | Permalink.